Let's face it: finding hair and skin products to bring out our inner beauty and keep us looking forever young can get expensive. Between the BB, CC, and ZZ Creams out there, and a never ending selection of natural hair products making all sorts of claims, getting exactly what you need can be confusing and lead to extreme product junkie-ism (don't I know it). Well, what if I told you that you could get your hair and skin in tip-top shape by taking a trip into your kitchen? No, you're not reaching for the same old eggs, banana, avocados, yogurt, and honey. This time around, we're going to explore 8 foods that you probably didn't expect to do more than taste good. FYI, you can load up on all these foods during meals (although I wouldn't recommend it for coffee and chocolate), and reap the same benefits (and more) for your hair, skin, and body! Regardless of how you feel about coffee, there is one thing about it that you can't deny: the caffeine content. When taken internally via your favorite latte, espresso, or plain cup of joe, caffeine stimulates body and brain function, causing you to move a mile a minute. Much in that same way, coffee stimulates skin and hair follicles. 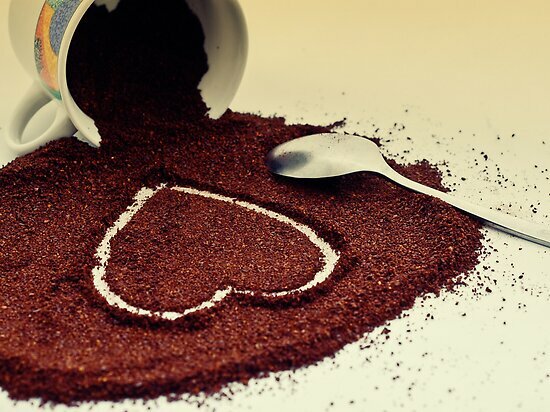 For the face and body, coffee helps energize and exfoliate (coffee grounds) skin, and relieves under-eye puffiness. It also can help improve the appearance of cellulite when used over time. As far as hair goes, coffee can help stimulate circulation on the scalp, encouraging healthy hair growth - especially for those suffering hair loss. It also improves shine and depth of color. For a DIY coffee fix for skin, try mixing fresh coffee grounds with your favorite oil of choice (I recommend an Extra Virgin Olive Oil and Jojoba Oil mix) and sugar. This scrub can be used on the face and body to exfoliate skin and help you reap all the benefits listed above. To get the caffeine going on your hair, brew a strong pot, cool, and pour into a spray bottle. You can aim the nozzle at your scalp for a massage, or use in the shower as a hair rinse. If you're interested in trying out some great caffeinated products, try Hairitage Hydration's Jar of Joe, and The Pomade Shop's Café Au Natural Coffee Shampoo and Conditioner. I'm sure your first reaction to this vegetable was either "ooh!" or "eew!". Okra is one of those definitive things that you either love or hate. With a crispy, slightly fuzzy exterior and a slimy, beady-filled interior, you can't sit on the fence about this one. I happen to love okra as a food, but now even more as a cosmetic powerhouse! Okra is rich in vitamins A, C, and E, antioxidant vitamins that fight free radicals and promote healing. Vitamin A is known to soothe irritated scalps, and help remove fine lines in the skin. Vitamin E also promotes UV protection It also contains folate and biotin, both essential to healthy hair growth and skin regeneration. You can use one bunch of okra and whip up your own hair conditioner and facial masque. Boil about 2 cups of chopped okra in about 2 cups of water for 20 minutes. Remove the okra (still in the pot) from the heat, and allow it to steep for about 10 minutes. Pour the entire contents into an airtight jar, seal, and allow to steep overnight. In the morning, you will have a jar of slimy stuff - pour the slime into a separate container. You can use the slime as-is for a conditioner, or use it as a part of a mix for another DIY project. With the leftover okra pods, throw them in the blender with a 1/4 cup of water (and some other goodies if you wish), and whip them into a mask that can be left on your face for 15-20 minutes. If the above sounds like too much work, try Shescentit Okra Hair Repair Reconstructor. This is a tough one for me to swallow - I can't stand carrots. But for my hair...I will tolerate them (don't judge me). Carrots are ridiculously high in Vitamin A - with 1 carrot providing 200% of the daily recommended value. As we learned with okra, Vitamin A is a valuable antioxidant that fight damage caused by free radicals, promotes anti-aging of hair and skin. For super soft hair and skin, whip up a batch of boiled carrots, honey, and olive oil (make sure the carrots are blended WELL). This mask will give you soft and shiny hair, and glowing, tightened skin. If you're not interested in cooking carrots for anything other than dinner, try AfroVeda's Carrot Seed Clarifying Shampoo Bar or Kyra's Shea Medleys Strength + Emollient Butter Cream. Although visually unassuming, tomatoes are a nutritional powerhouse. 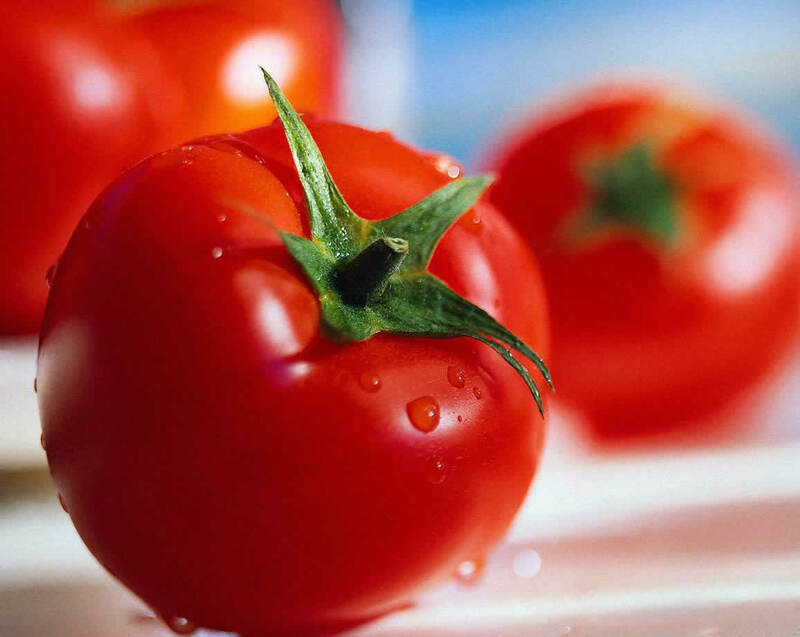 Tomatoes are an amazing source of Vitamin A, Vitamin K, B1, B2, B3, B5, B6, magnesium, phosphorus, iron, sulfur, and more. It has tons of antioxidant, detoxification, soothing, and rejuvenation properties for hair and skin. The vitamins and minerals in tomatoes help even skin tone, helps heal and prevent acne, shrinks enlarged pores, and regulates sebum production - which is especially helpful for those with oily skin. In the hair, tomatoes are known to help with the same sebum regulation, soothing and correcting dry itchy scalp conditions, and increasing shine and elasticity in damaged, dull hair. For an easy DIY mask that can be used on hair or skin, grab a tomato and half an avocado and blend well with a few tablespoons of olive, sweet almond, or jojoba oil. Because tomato is acidic and can be drying, adding more oil(s) can help prevent dryness and enhance softness. Not feeling like making the mix? Try the Yes to Tomatoes line of skincare products, and the Yes to Tomatoes Volumizing Conditioner. I promise, we're not making a salad here. Besides making excellent pickles and puffy-eye treatments, cucumbers are rich in silica, Vitamins A and C, potassium, and more. Aside from packing a powerful antioxidant punch, silica-rich cucumbers increase firmness of skin, elasticity of hair and skin, and reduce inflammation. Cucumbers are also sulfur rich, which is essential for hair growth. Sulfur is a building block of hair, and the sulfur from cucumbers can stimulate increased healthy hair growth. For a DIY mask that is sure to soften and strengthen hair, blend 1/2 a cucumber into a paste (in a blender is recommended). Add in a few tablespoons of your favorite oils (olive oil, apricot seed oil, or sweet almond oil are my personal picks), 1/4 cup of coconut milk, and 1/4 a cup of your favorite conditioner (something like Trader Joe's Nourish Spa is ideal). Turn this recipe into a cool face mask by substituting the conditioner with 1/4 cup of oats blended into a powder and mixed in. If you're more into purchasing something with cucumber, the Yes to Cucumbers line is a great place to start for skin and hair care. Hair One Cucumber Aloe Cleansing Conditioner is also another great option. Blackstrap molasses in all of its dark, thick, sticky, and bitter glory is another nutritional powerhouse that benefits both skin and hair. It is packed full of vitamins and minerals that lends itself to healthy body, hair, and skin. Packed with iron, calcium, manganese, copper, magnesium, or potassium, blackstrap molasses promotes skin rejuvenation and hair growth. It is especially nourishing and conditioning for dry, damaged, or over-processed hair, improving shine, strength, and elasticity. For acne prone, dry, or rough skin, dilute 1 teaspoon of unsulphured blackstrap molasses with 2 teaspoons of your favorite oil (jojoba or olive oil are recommended). For an added boost, you can add a teaspoon of apple cider vinegar. You can use the same recipe as the base for a hair mask, or just throw a few tablespoons of blackstrap molasses into your favorite conditioner to reap the benefits. If you can't see yourself buying a bottle of molasses, give My Honey Child's Molasses Hydrating Deep Conditioner a try. This one holds a special place in my heart. When fall rolls around, I'm #AllPumpkinEverything. Seriously, one trip to Trader Joe's and I go nuts. Luckily for me, not only does pumpkin make for some delicious food creations, it hosts a number of healthy hair and skin benefits as well. Pumpkins, like carrots are packed with beta carotene which not only gives it an orange hue, but naturally provides the body with tons of free radical-fighting Vitamin A. Pumpkin enzymes are also full of zinc, and Vitamins E and C - making the fall staple healing, soothing, and hydrating, among other things. Pumpkin can help reverse damage to skin, reduce lines, and help provide a youthful glow. For the hair, pumpkin is moisturizing, soothing, shine-enhancing, and elasticity improving. Treat yourself to a DIY pumpkin deep conditioner with half a can of cooked or pureed pumpkin (baby food pumpkin is the easiest to work with), 1/4 cup of plain greek yogurt, and 2 tablespoons of honey. Get pumpkin on your face by swapping out the greek yogurt for a few tablespoons of your favorite oil. If you don't want fresh pumpkin for anything but pie, pick up a bottle of Darcy's Botanicals Pumpkin Seed Curl Moisturizing Conditioner. For as long as I can remember, I've loved chocolate. If I could eat chocolate every day, I would. As it turns out, I can get my cocoa fix without sabotaging my workouts - because chocolate is great for the hair! Chocolate is antioxidant rich, which combats free-radicals (those pesky little things that can make our hair and skin look aged). Youthful hair has more shine, body, strength, and elasticity - making it less prone to breakage and damage. Cocoa butter is a powerful emollient and softening agent. Not only does it possess amazing healing and soothing properties for the skin and scalp, it softens hair and promotes shine and elasticity.Chocolate has flavanols, which are proven UV protectants. Natural sunblock that smells heavenly? Yes, please! If you want to whip up something chocolaty for your hair or skin, try a cocoa butter hot oil treatment mix of 2 parts cocoa butter and 1 part coconut oil. You can also get in the kitchen with 6-8oz of plain greek yogurt, 2 tablespoons of pure cocoa powder, 3 tablespoons of your favorite oil(s), and 2 tablespoons of honey. Blend to an icing-like consistency, and apply to hair as either a pre-poo or deep conditioning treatment. Skip the greek yogurt and apply it to your face as a mask. Of course, you can always take the easy road and just add a few tablespoons of pure cocoa powder to your favorite conditioner or creamy face wash.
Of all the food ingredients, chocolate is probably the most popular. Check out these amazing chocolaty products if DIY doesn't work for you: Pura Body Naturals Chocolate Hair Smoothie, All Things O' Natural Natty Cupuacu & Rhassoul Deep Conditioner, Camille Rose Naturals Algae Renew Deep Conditioner, Purgasm Shop Wild Cherry Treatment Hair Truffles, Qhemet Biologics Cocoa Tree Detangling Ghee, and Soultanicals Knot Sauce Coil Detangler. What are some of your favorite food items for hair and skin health? I can't stand okra like you can't stand carrots! Yuck! I just can't. Very informative article. Eating healthy food plays an important role for beautiful skin, health and hair. Thanks a ton for such an interesting information helped a lot. Diet is an important part of our skin care routine. It is important to have a proper diet in order to grab all the nutrients that are essential for the skin.